No holds barred, no beg your pardons - it’s the wildest improvised fight Melbourne has to offer! 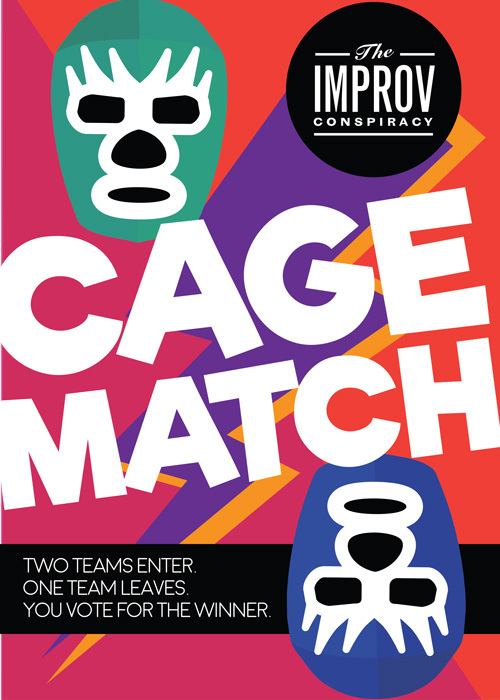 The Improv Conspiracy presents - CAGE MATCH! Each week two teams go head-to-head at The Improv Conspiracy Theatre. Nothing is off limits as long as it's improvised - any theme, any format, anyone. Once they’re done the audience votes on a winner - with the champion returning the next week to face off against a new challenger. This ain’t a poetry slam, this ain’t a rap battle. This.. is… CAAAAAGGGGEEEEE MAAAAAATTTTTTTTCCCCCCHHHHHHH! 1. Each team is given twenty minutes to perform. At twenty minutes, the house lights will be turned off and the performance will be declared dead. 2. Each audience member will be handed one voting slip on entry. Once the show begins, no more voting slips will be handed out. If your voting slip is lost, replacements will not be provided. Voting slips will be collected at the end of the night, so you'll have to watch both teams to vote. 3. The night’s team members are not allowed to vote. Everyone else is able to vote. 4. The producers and interns will count the voting slips. Write-in votes, votes on non-Cage Match voting slips, and threats written on scraps of paper will not be accepted. Cash bribes will be accepted but not influence the vote. 5. The team with the most votes wins - no recounts, no complaints. 6. In the case of a tie, each team will be given five additional minutes to perform and the host will declare a winner. Want to enter the Cage Match? First, read the official FAQ. Next, email josh@improvconspiracy.com for access to the entry form!